To provide a loving, secure Christian atmosphere where children can develop body, mind, and spirit. 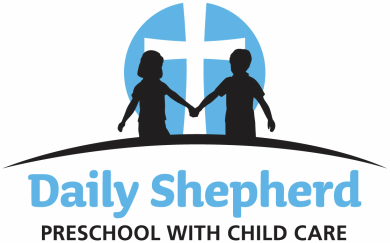 Daily Shepherd Child Care Center is a smaller more intimate faith based center. The heart and soul of our center is the love of our Lord and Savior, Jesus. With that as our focus, at our center you will find a loving, warm, and faith-filled staff that will help your child grow spiritually, academically, socially, emotionally, and physically.We have a "family like" feel which you see as we learn, play, and eat together. Children are embraced for who they are and we help them grow from where they are at so they can become all that they can be. We believe that God values each child and gives each his/her own special and unique blend of abilities and needs. We want our school and center to be a place where God's love is seen. There are activities that specifically show that our faith is evident: prayer at meals and snacks, Bible stories, memory verses, songs, and the celebration of Christian holidays. We believe that our faith should shape the way that we care for children. Daily Shepherd seeks to create an environment that inspires confidence in parents by maintaining a safe and secure setting for their children. We work in partnership with parents and invite parent communication and participation. Monday through Friday, 6:00 AM - 6:00 PM. Preschool is incorporated into the day care but there are limited spots available for preschool only. Preschool runs from 9:00 AM - 11:30 AM. The Preschool follows the Jenison Public School schedule and will not operate on any days JPS are closed due to Holidays and scheduled days off. We accept children who are potty trained AND have reached 2 1/2 years of age through kindergarten. In Summer we accept children through Age 12. DSCCC provides healthy, "home-cooked" meals served family style. Breakfast, lunch, and snacks meet the meal pattern guidelines set forth by the Child and Adult Care Food Program (CACFP) operated by the Michigan Department of Education. Providing children with proper quantity and nutritional quality promotes optimum nutrition which supports growth and development in all children. Meal and snack schedules are posted on the board in the hallway by the lunchroom. During meals, we as a staff work on teaching the children good manners as well as self-help skills such as serving themselves and cleaning up after themselves. Spiritual Growth: At Daily Shepherd we strive to guide our children in spiritual growth through a secure and loving Christian environment. We do this through the use of Bible stories, songs, prayers, memory verses, weekly chapel time, and general conversations as they learn about their world around them and the God who loves them. Social/Emotional Growth: While in our care we want our children to develop a positive self-concept and develop their own individual strengths. We want them to have an excitement for learning and a positive attitude toward school as well as self-confidence to try new experiences and meet new people. We encourage this through supervised play and guiding the children through problem solving and conflict resolution. We allow and encourage all the children to have a voice to be able to share their thoughts and feelings. Academically: We want our children to be academically prepared for kindergarten by the time they leave our care. To accomplish this we have an active learning curriculum where children are involved in direct, hands-on experiences with people, objects, ideas and events. The learning environment is arranged in several clearly defined interest areas that enable the children to find, use, and return the materials they need in order to explore, invent, and learn about their world. We use ZooPhonics to help the children learn their letters and sounds. Each letter is assigned an animal and body movement. The ZooPhonics program fully involves the child's eyes, ears, mouth, and body as they learn phonemic awareness and the alphabet. This program is also widely used in local school districts so the transition into kindergarten is easier. We also develop math skills of counting, number recognition, and beginning math concepts including more/less, sequencing, and one-to-one correspondence. Science, art, and music are also important aspects of our curriculum. Physical Growth: Daily Shepherd is blessed with a large, fenced in playground that helps our children develop coordination, strength, and agility. Our playground offers an opportunity to run, climb, jump, and explore in a safe environment. Based on weather conditions, we take the children outside everyday. If weather does not permit us to go outside we have large muscle activities that we use indoors including parachute activities, stepping stones and balance beams, tumbling mats, and tunnels. We encourage the children to be active and participate and enjoy watching them grow in their abilities.